Choosing to renew your wedding vows is a lovely way to celebrate the years you have been together. It be because you are coming up to a big anniversary or you have come through a particular tough time with your health or your relationship. Whatever your reason it is a time of celebration! Whatever your religion it is possible to have a religous ceremony for your renewal of your vows. Have a chat with your local place of worship and they will be able to explain how the ceremony goes and what you will need to do to be ready! You will want to have a chat quite early on in your plans as Places of Worship do get booked up a long time in advance for weddings. If you are planning on your renewal on your wedding anniversary then that will quite likely be a popular time. "15 years ago I promised to love you, honor you, comfort and keep you. To be by your side in sickness and in health, in times of want and in times of plenty, for better or worse, for the rest of our lives. Today, I promise in front of our family and friends to continue loving you as we enjoy the journey together for the rest of our lives." You can also incorporate poems and quotes into your ceremony, have a look at some of these to maybe use as part of your day, or even just to read as they are beautiful poems that describe the love you have for each other through the years. They come with a warning that they may make you cry! There are also lots of great anniversary poems for you to have a look at on our site. 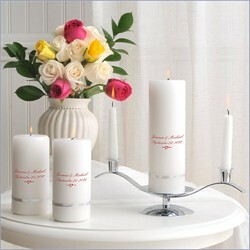 As well as readings you could also look at adding a Unity Candle or sand ceremony as part of your vow renewal. They are used in weddings to show the joining of two families but you could use the same ceremony to show how your family has grown since you were married. You both could light the candle together and then have your family and friends come and share the flame by having their smaller candles lit from the main one. "The love that we have together is strong, this flame represents the love that we have for each other and the love that we share with you as you are such an important part of our lives, thank you for being with us on our life journey together."